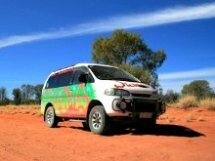 You will need camper windows, either for your homemade camper van conversion or as a replacement for your damaged window on any kind of a recreational vehicle. Windows provide light, fresh air and a change of scenery for the people that ride along on the back seat (your kids, friends and pets for example). In most countries, fitting aftermarket windows will require following certain government regulations, so check with the local authority before you get started. In my country, this is for security reasons. Each row of seats has to have an escape hatch in case of emergency, which makes a lot of sense as far as regulations go. Fitting camper windows is another thing. It's not all that difficult to do it yourself, as it is quite hair-raising while preparing yourself to do it. Just imagine, you have your panel van in front of you, instructions from the window manufacturer (if you have a new window of course) and a head loaded with all the information from the different sources, trying to explain how and what to do. Patience, confidence and a steady hand it's all it really takes. You're cutting a large hole in the metal panel of your van and if you're not confident enough,well take measures... once, twice or even the third time if you need so. You'll be just fine. There are of course qualified pro's that will do the job for you. It will cost a little bit more, but you'll spare a couple of gray hairs doing it. 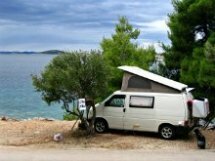 Caravan windows have been and are still largely used (at least here in Europe) on camper van conversions and entry models of larger motor homes. They come in all shapes and sizes, therefore you'll have no problem choosing the type you need. These plastic camper windows are relatively cheap and if you can get an old donor caravan, you'll be saving some money for other expenses. They come in two parts. One part goes on the outside of the van the other on the inside. The two parts are held together by bolts or screws and lots of sealant of course. 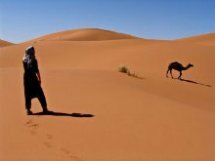 The metal wall of your van is usually very thin compared to the thick and insulated wall of a caravan. Adding a frame made out of wooden battens on the inner side will do the trick. 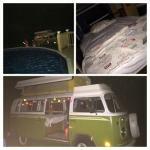 These "old school" classic style camper windows are the ones that pretty much dominate the market. They're quite cheap, don't swing up, but you can find sliding versions, where one half of the window slides over the other. The glass of the window is mounted in a rubber frame, which finds it's place in the hole of the panel van that you have to cut out. Here you have to be careful with the size of the hole, as there is not much room for mistakes. 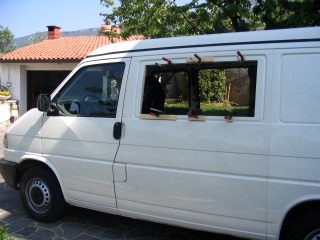 If you try hard enough, you can get these windows on old vans or buses before they get smashed away at a scrap- yard. These are modern day type of windows and are today factory fitted on many vehicles. They come flush with the body and are also available as camper van windows. Many shapes and sizes are available in order to fit most vehicles on the market. Some models can swing up like the good old caravan windows, while others have an incorporated sliding hatch to let the fresh air in the van. 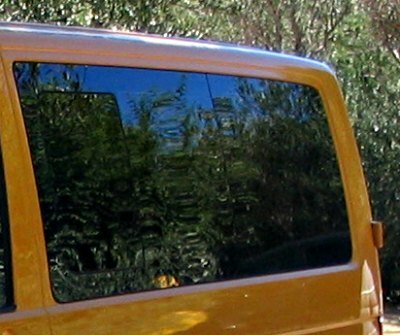 Bonded windows are applied to the camper van body with special primers and adhesives. The whole process is quite demanding and requires some previous experience. These are also the most expensive windows on the market, so unless you want to look really fancy...well, it's your decision. Seitz, a part of the Dometic group, has been manufacturing quality camper windows for camper van conversions and larger motorhomes for years now. This is probably the best and most universal window you will find on the market for now. It comes complete with an inner and outer frame with air circulating vents all around, so you'll get a bit of fresh air in your van even when the window is tightly closed. It may look like a caravan window at first glance, but it is far more plush with the body of the vehicle. Available in many shapes and sizes, it will fit almost any leisure vehicle. It comes with complete instructions and it's rather easy to fit. The two frames are held together by screws and lots of sealant and include a sliding mosquito net combined with a thermal sun-shade. 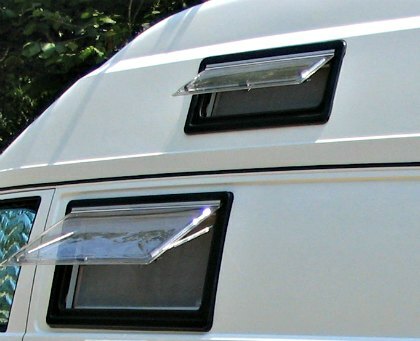 I have a couple of these camper windows fitted on my Volkswagen camper van conversion for years now, and all I can do is to recommend them. You can either buy the swing up or the sliding version. The price range is somewhere between the bonded windows and caravan windows, but these camper windows really include all you need and the quality just speaks for itself. 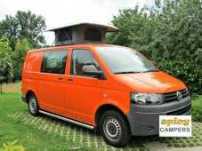 The well known camper van conversion companies like the German Reimo and British Just Kampers sell most of these window types for example. A power drill to drill a hole big enough to allow the jigsaw blade to pass through. A jigsaw to cut out the hole for the window. Be sure to get a lot of blades as they will brake along the way. A metal file will sharpen the edges after the cut. An angle grinder just in case. Cardboard, paper, thin piece of plywood or any kind of material to make a template if you don't already have one. Primer paint to cover the bare metal and prevent it from rusting. Masking tape or similar to protect the paintwork of your van while cutting with the jigsaw. You don't want scratches on your paint, do you? Use several stripes, just to be on the safe side. And do use safety goggles and gloves for your own protection. Your dealing with glass, plastic and sharp metal here! 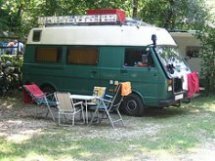 Assuming you already know where and how will all the furniture be placed in your camper van, then you're ready to make the cut. If you have a brand new stock window in your hands, you'll get all the instructions that you need. Follow them carefully as there is no room for mistakes here. If you have a used window, take your time and measure carefully the glass/plastic window plus the framework around it. This will now be the base for your template. 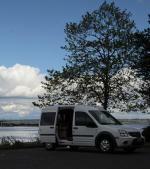 The van itself is best to work on with no insulation and furniture inside. It's much easier to fit the windows at this stage even if you have to use wooden battens for spacers. You'll do the fine work later on. Most vans are factory made and prepared to have windows fitted for different purposes. Sometimes you will find strengthening rails in those places and they need to be cut out. Here you will usually have to use an angle grinder or a chisel to get them out. Be careful though, you don't want to damage the panel here. Ready to cut the hole into your van now? Place the template inside of your van and measure everything carefully. Tape the template on the panel or have somebody holding it firmly. Drill four very small holes at the center of all four edges. And you can also draw an "X" or a cross line from the corners of your template and drill a small hole at the center. Take the template outside and position it between the four holes or stick a nail or something in the center hole and get the position you want. Again measure carefully and draw a line around the template. Tape two pencils together if you need the hole to be slightly larger then the window in order to pass the rubber sealing through for example. Drill a hole large enough to pass the jigsaw blade through somewhere near the inner edge of the line. The jigsaw blades for cutting metal are usually very small, so the hole doesn't have to be so large. Before you start to cut, use several stripes of masking tape around the outside edge you had previously drawn around the template or mask the jigsaw shoe. Mask both if you really don't want any damage on the van's paintwork. Again, before you cut the hole double measure everything. When you get everything right, stick the blade of the jigsaw through the hole and start cutting around the edge. Keep a steady and firm hand but don't force the jigsaw too much. Be careful around the corners. The jigsaw does a fine job here, just get your grip right. Tape the loose metal with masking tape so it doesn't flap all around and take a break when your hand starts to hurt. Once the hole is finally cut, file the edges and remember to carefully clean the body of the van from any loose metal fillings. They will cause the body to rust with the first touch of water. Paint the bare metal edges with primer paint to prevent rusting and let it dry. New windows always come with detailed installation instructions. But just in case you have used windows, you can read this general guide. And having a couple of helping friends nad hands will make installation much easier. Caravan and Seitz camper windows are easiest to fit. They are both made from two parts. You fit both parts in the hole, one part on the outside and one on the inside. Remember to use a lot of sealant on the outer part and then bolt or screw them together. You will have to make a wooden frame though, because these windows are manufactured for panels thicker the the sheet metal of the van. For rubber mounted camper windows, you'll need to fit the rubber around the glass on a workbench for a start. You need to establish where the two ends will meet and get a straight cut there. Bond the two ends with rubber adhesive. There is a lip in the rubber which overlaps over the metal bodywork. Push a nylon string or a cable into the lip all the way around so the two end overlap about 15cm. Use silicone spray or washing liquid all the way around the outer edge of the rubber to help it slip over the outer metal panel of the van. Start at the bottom edge and then slowly and firmly working your way to the top edge. The idea of having a nylon string or a cable in the lip is to pull it inside the van in order to ease the lip over the panel. Remember to have a couple of helping hands outside the van holding the window firmly in place, while you pull the cord inside. 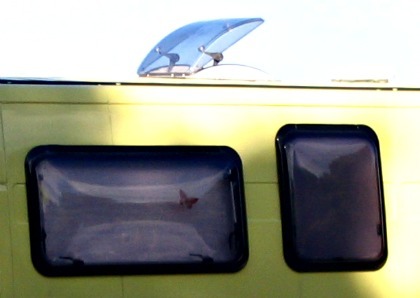 Fitting a rubber frame on bonded camper windows is very similar to fitting it on rubber windows. Apply sealant where the window will be held against the bodywork. The idea here is bonding the camper window in place with a special adhesive. The adhesive has to be used with special primers, one for the glass and one for the van body. The adhesive has a rapid bonding effect, so be careful to position the window right the first time. Fitting camper windows is perhaps one of the most demanding jobs if your building your own camper. But It also feels great when the job done, doesn't it? Well, now that you've finally finished a great job , go and have yourself a beer or any other kind of beverage, you deserve it!